LET US KNOW - Contact us and we’ll do our best to get it in for you. Give us a call today at 961-1122 or email us. Welcome to Big Island Used Cars - the island’s one-stop source for quality pre-owned cars, trucks, vans and SUVs! 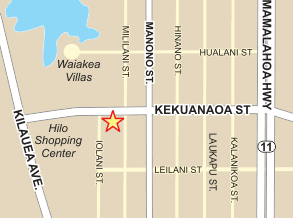 We are locally-owned and operated and believe in providing you with quality service and exceptional value with aloha. We are constantly updating our extensive inventory - if you don’t see what you’re looking for, just ask and we’ll do our best to get it in for you. Give us a call today at 961-1122 or stop by and check us out at the corner of Kekuanaoa and Mililani Street on the way to the airport. Thanks for visiting our website and we look forward to helping you get into the vehicle you want at the price you need! Big Island Used Cars, llc. Price plus tax, license transfer fee $5, documentation fee $295, and any applicable finance charges. While every effort has been made to ensure display of accurate data and pricing, this listing may not reflect all accurate vehicle data and is subject to human error. All inventory listed is subject to prior sale. The photo shown, if any, may be an example only. Please consult dealership personnel for further details.